Click on any of the links below for answers to these frequently asked questions. We’re looking for outstanding boys and girls between 8 and 18 who love to ride bikes and who can live up to our high standards of sportsmanship, teamwork, and academic performance. Team members must maintain a 3.0 GPA to participate. The first step is to complete a brief evaluation ride with one of our coaches. After that, just fill out the application and pay your team dues. Team dues for the full March-October season range from $150.00 to $275.00 depending on which program you join. Pro-rated payment options are available for kids who join later in the year, or who cannot commit to the full season. 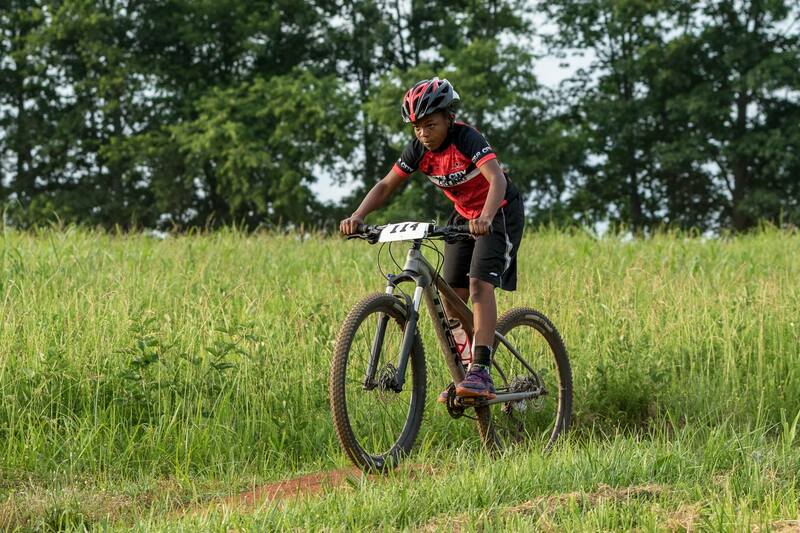 As youth sports go, bike racing falls somewhere in the middle of the cost spectrum. While it is substantially more expensive than typical school or rec league sports, it is less costly than most elite level travel sports. Assuming you already have a suitable bike, you will also need to consider routine maintenance and repairs, clothing, shoes, travel costs, race entry fees, etc. Do You Offer Financial Assistance For Kids Who Need It? We are a very small organization with a limited budget, but we don't believe money should stand in the way of any kid who wants to join our team. Every situation is different, but if you need help with equipment, membership fees, or anything else to allow your child to participate, please contact us and we will do our best to help. All information related to financial assistance will be strictly confidential. There are only a handful of things that you must have in order to participate. In addition to a mountain bike, riders will need a helmet, gloves, hydration pack, and a flat tire repair kit with spare tube. We do offer matching team helmets at deeply discounted prices. We also recommend a Road ID or similar emergency identification. Most intermediate and advanced level riders will want clipless pedals and cycling shoes but these are not required. If you need assistance selecting any of these items please discuss it with one of our coaches before making a major purchase. You will need a fully functional mountain bike in safe working order. That means a front suspension fork, a wide gear range for hilly terrain and knobby tires at least 2 inches wide. Hydraulic disc brakes are highly recommended but not required. We also recommend a minimum wheel size of 26 inches for all but the youngest riders. Most importantly the bike should fit the rider. Bikes that are too big or too small can be dangerous and will prevent kids from developing proper skills. If you are planning to purchase a new bike, please consult with one of our coaches first to be certain you make an appropriate choice. Please note the our primary focus is on cross country riding and racing. Enduro or DH style bikes are not appropriate for our racing program. When & Where Do You Practice? Our JV and Varsity Competition teams practice on Wednesday evenings at 5:30, and the Adventure Club practices on Thursday evenings at 5:30. During the school year we ride until 7:00 PM, and in the Summer when there is more daylight available we usually go until 7:30 or 8:00 PM. We normally meet at the Crystal Spring Fire Station in South Roanoke and practice on the Mill Mountain trails. During the Summer we also occasionally ride at Explore Park or Carvins Cove. Supplemental practices during the racing season are often held at Fallon Park. Our official practice season runs during daylight saving time each year. This is typically mid March through late October. We will also hold occasional weekend rides and activities as weather permits during the winter months. Pre-season racing begins each year in early February. We also offer the option to join for the Spring, Summer or Fall sessions individually if you are unable to commit to the full season. We work on a progression of skills and fitness throughout the season and those kids who attend practice most regularly are the ones who make the most significant progress. Those who miss practice frequently find themselves falling further behind as we get deeper into the year. We do ask that all of our members make the same commitment that they would make to any other team or any other sport, and that means regular practice attendance is expected. What Happens If I’m Late For Practice? Unlike other sports, our playing field extends for miles, so you can't just run out and join the group a couple of minutes late. When you show up late for practice it impacts the entire team. We do our best to begin practices promptly at 5:30 each week. Our only options if you are late are to make the entire team wait for you before we take off, or to leave without you. We offer separate programs for kids who want to race, and for those who just want to ride for fun without the pressure of competition. Kids who join our Adventure Club are welcome to race if they wish, but there is no racing requirement. There are specific racing expectations for members of our JV and Varsity Competition teams. Please see the Racing page for details. Can I Play Other Sports While I’m On The Team? Yes. We believe that the best way for kids to develop as well rounded athletes is to participate in a variety of sports and activities throughout the year. Unlike many other youth sports programs, we will never require a team member to make an exclusive commitment. The only thing we ask is that before you join the team, make sure that your schedule will allow you to attend practices, races and other team events on a regular basis. We expect that members will make the same commitment to our team that they would make to any other team or any other sport. If you are already committed to another sport on a year-round basis this may be difficult. We do offer the option to join for either the full March-October season, or for Spring or Fall separately. Will Mountain Bike Racing Make Me Cool? Absolutely. Mounting scientific evidence suggests that kids who race mountain bikes are up to 93% more awesome than kids who don’t.